Louise is the salon owner. She was formally Mops salon manager, and has an extensive wealth of experience. She has vision and passion, not only for her own work but for that of her team in hairdressing and customer service. She is a great inspiration and teacher and loves to see her team do well in all aspects of hairdressing. Louise is a very busy stylist, from her precision cuts to diverse colour techniques and she also is a hair-up and perming specialist. She is an award-winning Trend Vision finalist. Allan has 15 years experience and received extensive training from L’Oreal, Saks, Regis and Wella before joining Zanders in 2008. Allan is now salon manager, ensuring the salon runs smoothly and efficiently. He has the ability and vision to do amazing colours and cuts and has an excellent eye for current trends, from big bouncy blow-dries to hair-ups. He is also an extension specialist. His skilled barbering means he has many loyal male clients. Allan is a perfectionist in all he does – from his precise highlight work to his creative cutting – and is an award-winning Trend Vision finalist. Julie has been with us since February 2012. She is an amazing hairdresser – trained both as a stylist and technician at Toni & Guy, where she became the ’in-salon’ trainer. Her last full-time employment was at Toni & Guy in the Metrocentre. Following this she took the position of trainer for a hairdressing training provider. She is a great asset to the salon as her technical work is of a very high standard and we are now in the process of developing a training programme for our team. Bet and Becca are our two assistants. Beth is our youngest and has worked with us since November 2016. She is great with our clients and does a fantastic shiatsu head massage. I see a bright future for this one. Becca is our newest member of staff and has been with us since March 2017. She is a second year assistant and is already showing of her hairdressing skills with colours and blow-drys on the salon floor — which by the way, she is already good. A great new addition to our team. Introductory Offer — New customers click here for our introductory offer: £5 OFF first visit, £5 OFF second visit. It’s the day when you are the centre of attention. At Zanders we’ll make sure your hair looks as stunning as the rest of you. We’ve built our reputation on quality and professionalism – with added style. 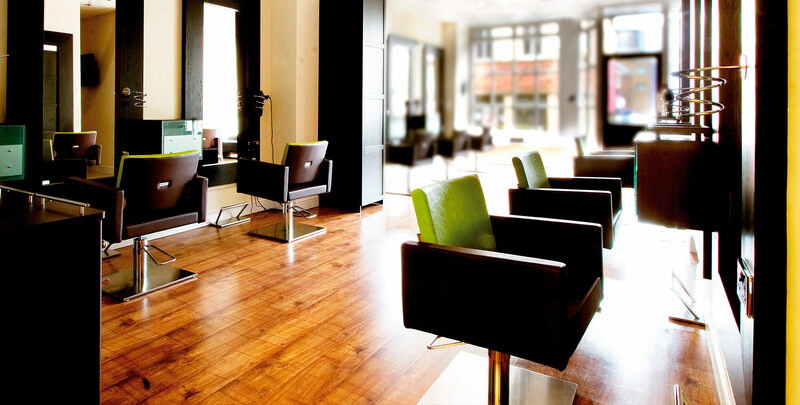 The tension may be rising elsewhere but we’ll make sure that your salon visit is totally relaxed. You will be allocated your own top stylist and if you want, we can organise a Buck’s Fizz for the perfect start to your special day. Of course, we can organise a home visit if that fits in with your schedule better. Zanders can also look after your bridesmaids’ hair as well as your guests. In fact, why not try out our service before the big day by letting us make all the girls look great with our Hen Party special. Our rates: Brides – from £45. Bridesmaids and guests – from £35. For more information on our special service for wedding belles, call 0191 233 1311. At Zanders we use the highly innovative colours by Wella — Koleston Perfect (perfect for grey coverage and colour-intensity, an absolutely reliable colour results); Instamatic by Colour Touch (low commitment, ammonia-free, multi-dimensional hair colour); Illumina Colour (setting the new standard of luminous and healthy-looking hair). With all these and many more colours by Wella, we can tailor-make your colour for amazing results. The Tea Tree range of hair products from Paul Mitchell invigorates both the hair and the senses with tea tree oil, peppermint and lavender extracts. Tea Tree proudly support Reforest’Action, an environmental organisation that plants trees worldwide, in the areas where they’re needed most. Tea Tree’s Green Takeover has made a commitment to: plant 500,000 trees by the end of 2016; sequester over 85,000 tons of carbon dioxide during the trees’ lifetime; support rainforest conservation and reforestation projects in Peru and Guatemala; benefit local communities through better health and nutrition, as well as additional revenue; and protect soil from depletion and erosion caused by deforestation. Goodbye frizz, hello smooth! With Kebelo ADVANTAGE smoothing system you will get 100 days of frizz-free, easy-to-manage, healthy, shiny, smooth hair. We know how bad hair days can be stressful. We know years of styling and colouring can leave it prone to frizzing. And we know how much time and effort it takes to keep it looking beautiful. Those days are now over. With Kebelo’s revolutionary smoothing system you will get amazingly smooth, frizz-free, glossy, easy to manage hair. The Kebelo ADVANTAGE smoothing system takes three simple steps; cleanse, treat and maintain. Using Kebelo pioneered carbocysteine hair technology that allow the treatment to support, strengthen and revitalise each strand from within, weak, dull, frizzy, unhealthy hair is transformed to beautiful smooth locks filled with bounce and volume. It only takes one hour to achieve perfect hair that lasts for 100 days, and you can have your hair coloured straight after. This unique foundation treatment lets you loose the frizz whilst maintaining the bounces and volume, giving you even more styling freedom and an unbelievably healthy shine. Sebastian believe that our individualities are far too colourful to lock into one look. That’s why they never stand still, but always think ahead. Feel forward, look further. Stir up the norm and rise above the norm. For unlimited reinvention in hair and styling – or un-vention as we like to call it. Sebastian. What’s next? Sebastian is redefining the limits of fearless hair fashion, with versatile, groundbreaking products style the now. With innovation products, we can create superior styles and transform hair day to night – professional to provocative, whenever you want. And don’t be afraid to mix it up. Combining products for the most unique effects: gels and oils, creams and clays – there’s no limit to what we can create. We use the ‘Alchemic’ colour shampoos and conditioners by Davines to brighten any faded colour – from vibrant reds to fading blondes we would defiantly recommend this amazing range. Their philosophy — Quality to us means having freedom to create the best products with attention and respect for our environment, using high-grade natural ingredients, and applying scientific rigour to every product, we dare to believe in being original and authentic, which enables us to create what we call life-enhancing products. Did you know thinning hair is a broad issue affection 50% of people? It can now be managed so you can enjoy thicker, fuller-looking hair. Many answers on the market are either drug-based or serve to camouflage the condition. Nioxin’s holistic approach to thinning hair is very different. It does not aim to regrow hair or camouflage the issue. Nioxin’s innovative skincare-inspired technology delivers thicker, fuller looking hair. Whatever the factors underlying your hair thinning, Nioxin has the expertise to address your issue with an individually tailored treatment. Enter the world of personalised hair alchemy – a salon revolution – the new service from System Professional (SP) by Wella Professionals. SP’s cutting-edge hair care technology placed in your expert hairdresser’s hands. SP personalised hair alchemy combines SP’s cutting-edge hair care science and your hairdresser’s profound beauty expertise to craft your individual hair perfection. Introducing SP’s five different INFUSIONS, which, combined with any treatment mask, allow for over 35 personalised hair care prescriptions… sculptural volume fuses with flawless shine… polished smoothness fuses with ultimate repair… deep long-lasting hydration fuses with brilliant colour. With SP, your hairdresser can combine two different benefits into one customised treatment, creating truly personalised hair care, for individual hair perfection. We are excited to add the phenomenal Olaplex to the salon — the only salon system that rebuilds broken hair bonds. The system consists of two salon steps and one to take home. The simple three-step process includes a patented active ingredient that works on a molecular level to seek out broken bonds in the hair that are caused by chemical, thermal and mechanical damage. You can use Olaplex to restore compromised hair, or add it to another service to provide the ultimate breakage insurance. Step 1: Bond Multiplier. This concentrated first salon step rebuilds broken disulfide bonds and begins the process of preventing damage and repairing hair. Step 2: Bond Perfector. The second step continues to rebuild and restore any remaining broken bonds ensuring the strongest, shiniest and healthiest hair possible. Step 3: Hair Perfector. This final retail step provides clients with continuous protection from ongoing damage at home.